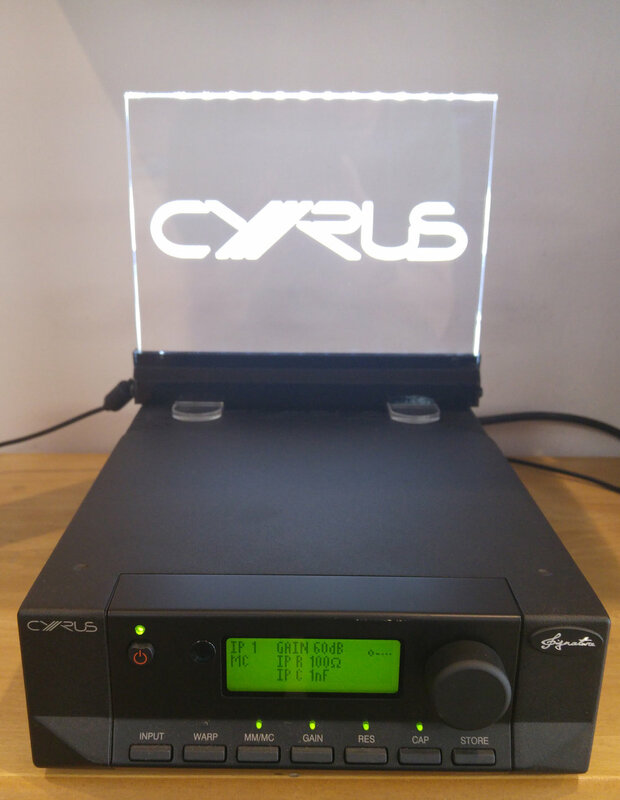 The Chord Electronics Qutest is the latest in an exceptional run of class leading DAC’s that are fast becoming the industry standard that all other DACs are measured against. The Chord Electronics Qutest, having evolved from its predecessor the 2Qute itself having not long won the 2017 What Hi-Fi? 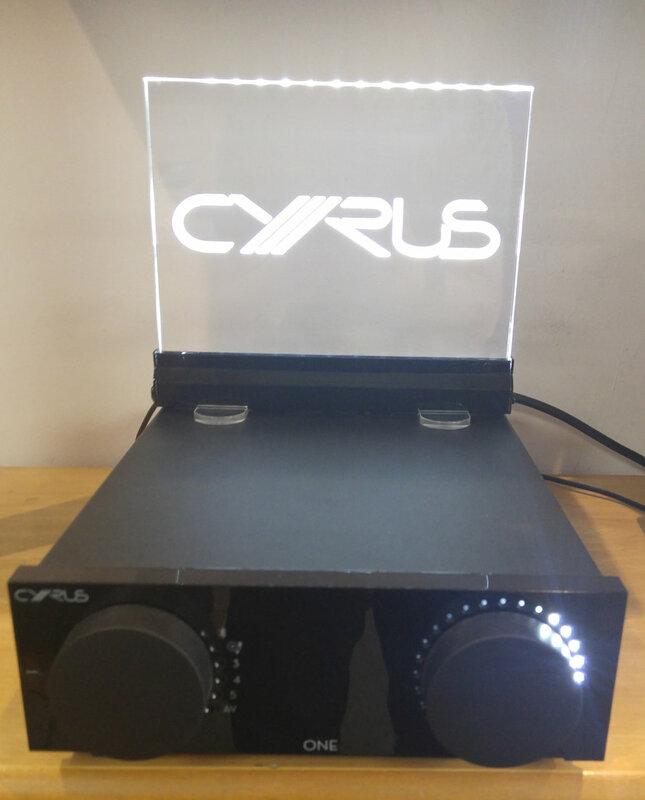 best DAC £500 - £1000, is already turning heads having being a star of The Big US Technology Consumer Show CES 2018. 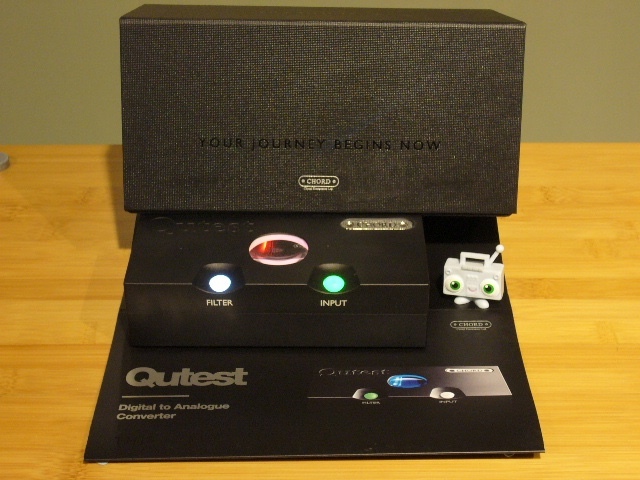 The Qutest is designed as a stand alone DAC to be used in home audio and desktop hi-fi systems and once again has that unmistakable John Franks design about it. It’s fair to say Chord Electronics stand out from the competition in looks alone. Precision milled from a solid aluminium billet the Qutest is no different, whilst it retains the circular porthole where you can peep into the workings of the circuit board and confirm through a range of colours the sample rate you are using, the actual functionality of the DAC has been improved enormously by the addition of colour changing fascia control spheres as used in the latest award winning incarnation of the Hugo 2 . 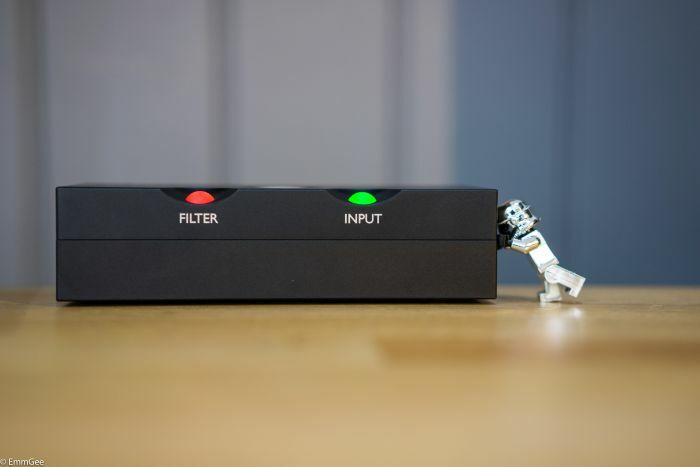 These allow input and filter changing at the push of a button. No more tiny pin head buttons that my fingers always seemed to struggle with. Lights showing filter, input and sample rate at a glance. 1 X Galvinically isolated USB-B input 32-bit/768kHz and DSD512 capable. 1 X Pair of stereo RCA sockets that can be set to output at switchable voltages of 1,2 and 3V RMS to match other sources plugged into your system. Power is via a Micro USB power supply that is permanently plugged in as unlike the Hugo 2 and Mojo portables has no battery on board. Whereas the other mains powered Hugo TT and Dave double up as digital pre and headphone amplifiers the Qutest has concentrated on the one job of decoding your digital sources be they from a streamer, CD transport or indeed being used to improve your television’s audio performance. Using technology from the latest Award winning Hugo 2 DAC and losing the headphone output and recharging capability has allowed substantial cost saving giving a performance and build quality unmatched in this price area, indeed if this is a permanently placed DAC in your system why pay for extras that are not required. The Ins And Outs of a Qutest. So what are they putting in the water in Kent that makes Chord Electronics DACs continually win award after award? Well, it has to be something to do with the Rob Watts FPGA (field programmable gate array) custom chip set. Unlike almost all the competition who buy off the shelf OEM Chips then apply in house technology to make them work in their DACs Chord use their own custom coded chips that somehow sound different to any other in the market place. Whether you think Chord DACs are better than the competition is probably personal taste but they do sound different. The best way I think I can describe them is to me they don’t sound digital, forget how much treble or how much bass they may or may not have or whether they are forward or analytical all words when describing other DACs. This DAC gives the impression of having an insight into the music without the digital hash that is often present with other DACs. 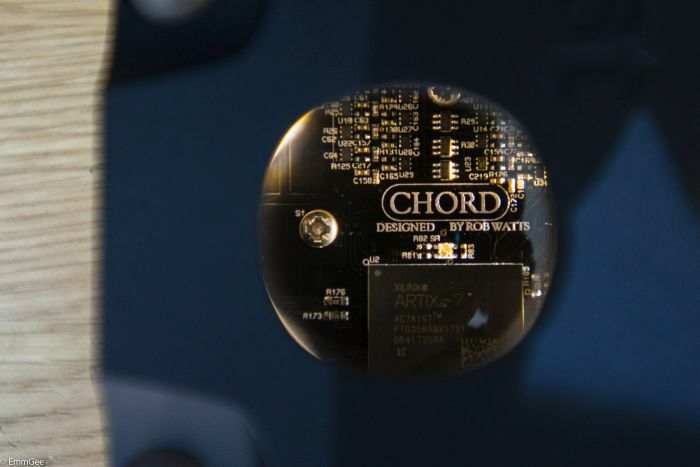 We can use words like detail, clarity, coherence, dynamic range, timing as many customers and reviewers alike have when eulogising about Chord DACs but there is more to it than that. We used our tried and tested dem track Duke’s Place from the Louis Armstrong & Duke Ellington album The Great Summit a recommendation incidentally. This track is testing in that Louis sings close to the mic and can exaggerate sibilance in a forward sounding system and the Double bass can appear overblown in an over exuberant bass heavy system, not with the Qutest though, even when playing with the filters which whilst can subtly change the tonal balance was never caught out. I also tried it connected directly to the digital output of a Naim Uniti Core over many hours and no matter the type of music from the Latin Rock rhythm of Los Lobos, Colossal Head to the Chilled Out beats of Bent The Everstanding Blink and through Tori Amos Night Of the Hunters showing all the subtleties her vast vocal range, it just sounded right and not once drew attention to itself. Visit Julian, Paul and John at Audio T Brighton store and hear it for yourself. 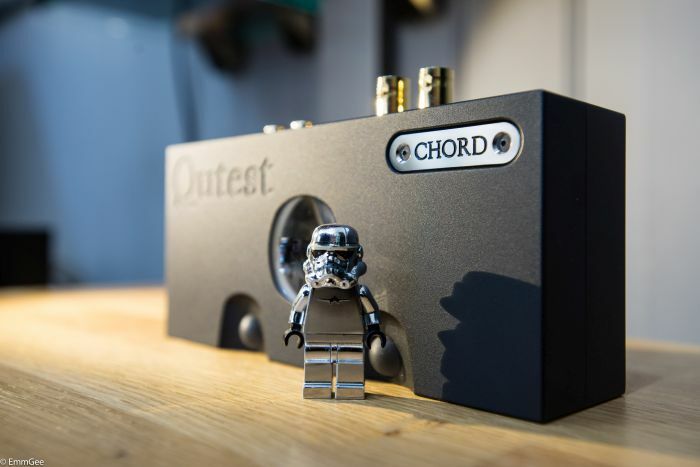 The new Chord Electronics Qutest DAC, marketed by Chord Electronics as a HUGO2 minus the headphone amp and battery, the dinky Qutest also manages to shed £600 from it's price tag. 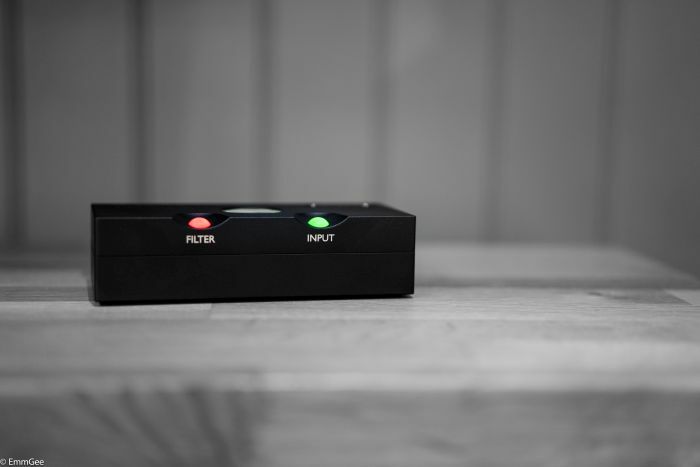 This has proven very popular indeed with us Audio T staffers. Such an animal was suggested when the original HUGO was released, so I'm claiming full credit here! This means we can now enthuse about the Chord Electronics HUGO2 headphone amplifier and DAC performance to those customers who think that £1800 is too hefty a price tag and had no intention to take a DAC out into the wild - so why should they pay for stuff they'll never use anyway? I'm happy to report that you don't have to. The Chord Electronics Qutest DAC is terrific. 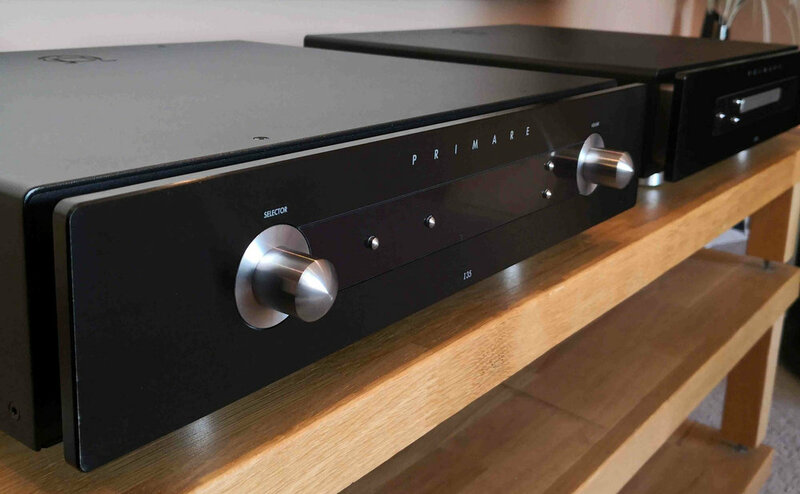 Used in between an Arcam rPlay streamer and an Arcam A39 integrated amplifier, with Dynaudio Special 40 speakers, the presentation is wildly improved. AC/DC's Malcolm Young's repetitive rhythm guitar riff on "Thunderstruck" is way more thrilling (I want to turn it up! ), deadmau5's synth bass on the track "SeeYah" is faster, tighter and forms a 3D solid roller of sound across the stage. Any digital hardness entirely gone. Initially the presentation appears quieter, then one realises that it's the absence of amplified noise. Norah Jones' voice on "Cold, Cold, Heart" is soft, dusky and alluring. It's no longer a voice in space, it's etched in place and sounds as if it's issuing from a human face (if that isn't too weird). Jones' piano playing is shown to be remarkably gentle; you can feel her just touching the keys rather than striking them. Glorious. The spacial information in the Scream Team Remix of Massive Attack's "Teardrop", rather than being out to the sides and above the speakers a bit, now envelopes you in sound. Music behind you from just the two speakers? Oh yes. I've only encountered that before in some very serious kit indeed. On demonstration right now at Audio T Swansea. We take a closer look at the Arcam irDAC II digital to analogue converter and headphone amplifier. 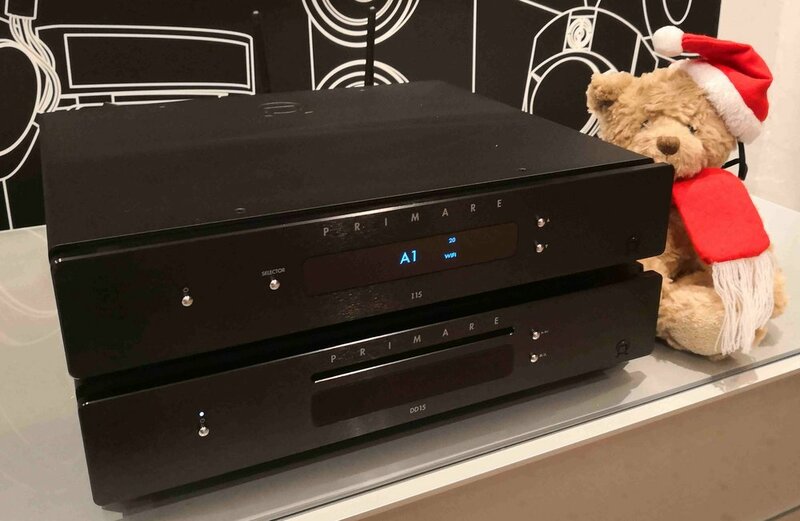 With the current revival of high quality headphone listening, it was with interest we learned that Arcam's replacement for their much admired irDAC would sport the headphone output stage from their £4000 FMJ A49 stereo amplifier. Handily, the digital out socket has been replaced with variable output analogue RCA phonos. This enables the unit to be used with a power amp or a pair of active loudspeakers which are often the choice of the desk bound audiophile. We also lose the USB-a port but keep the asynchronous USB-b port and Bluetooth functionality. It's also worth noting that the Arcam irDAC-II is capable of DSD128 replay. 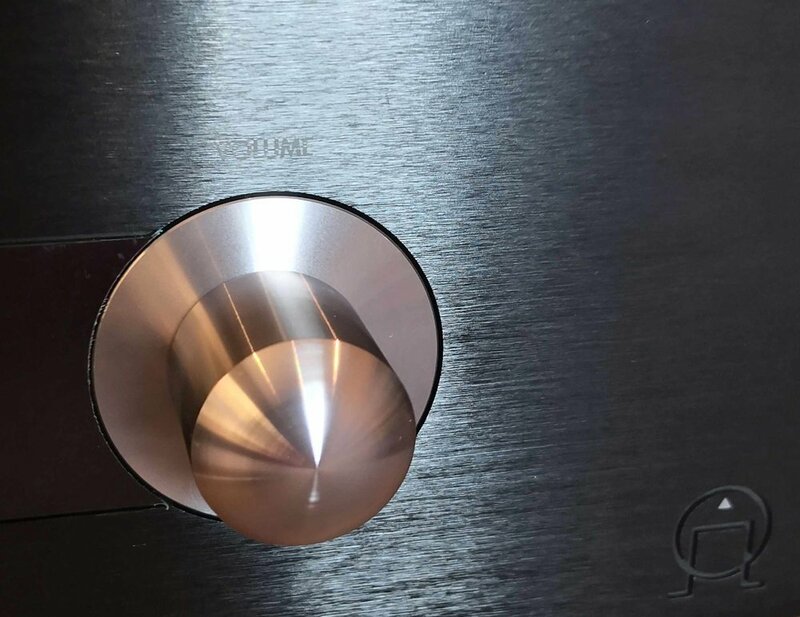 Arcam were the first company to launch an outboard DAC way back in 1987 (with the revolutionary Black Box) and they re-entered the DAC market with the rDAC a few years ago. The brief for this unit was to produce an enhanced design that would raise performance and improve ease of use by a significant margin over the existing rDAC. Arcam tell me that their engineers have worked hard to isolate the digital and analogue stages and develop ultra low noise power supplies to reduce digital jitter to vanishingly low levels. All of the inputs can be controlled through an IR remote control that will also give you transport control of a PC or Mac USB source. Well, very good indeed. We partnered it with KEF's revered LS50 stand mount speakers, Arcam's own very capable A39 integrated amplifier and rPlay music source. It was an immediate improvement over the DAC in the rPlay – itself no slouch. Spacial information was much more apparent, instruments were solid and punchy with a much fuller, fruitier soundstage. It didn't seem to favour any particular musical style, be it the finely etched Laura Marling “Soothing”, Fink's intimate live recording of “Trouble's What You're In” or the pounding beats of Gentleman's Dub Club. It's on demonstration in our music salon as we speak. Why not pop over and give it a try? We'll make you a brew while you settle in and immerse yourself in the music.